You cannot solve a problem if you don’t know what is the problem. Michael is driving his sports car at 30 m/s when he sees a dog on the road ahead. He slams on the brakes and comes to a stop in 3.0 second. What was the acceleration of Michaels’s car? What is asked in the problem? It is the acceleration of the car that Michael is driving. Do you remember what is acceleration? 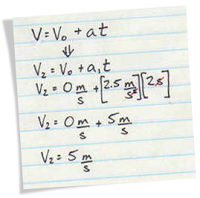 It is the difference between the final and initial velocity divided by the time. Do you have the formula of acceleration in your mind? 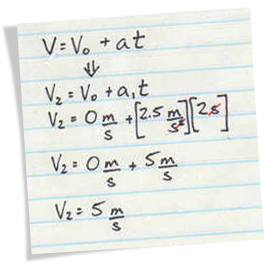 You have to memorize these formulas or if you can’t, just be familiar with them. You will soon notice that you can remember these formulas if you keep using them. This list of different physics formulas will help you. Now you know that you are given with three values in the formula and the Acceleration is the only one unknown to us. This is a common problem in problem solving. For example, you might be asked to find the Torque of a rotating stick but you are only given with the mass that makes it rotate. We know that Torque is equal to Force x Length of the lever arm. But we do not know the Force applied by the mass. To solve this, you have to get the Force using the given mass. Force due to the weight of an object is equal to Mass x Acceleration due to gravity. Now that you have all the variables except the one unknown, you can solve for the answer. Although you may stop when you arrived at the answer, it is always a good practice to state the answer of the problem. Therefore, the acceleration of the car is -10 m/s2. Now, share this article to that friend who is always bothering you.